million and individual songs total over 160 million and are still selling. 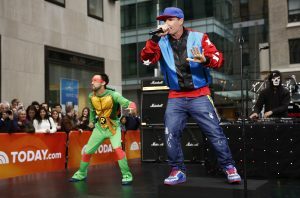 Vanilla Ice won 2 MTV Awards, a People’s Choice Award, and was nominated for a Grammy. Ridiculous Six with Adam Sandler. His TV credits include Celebrity Boxing, Hollywood Squares, The Farm -UK, Surreal Life, Celebrity Bull Riding, Dancing On Ice 6, Canada Sings Seasons 1&2, and the DIY shows The Vanilla Ice Project Seasons 1,2, 3, 4 & 5, three episodes of Ice My House , and series Vanilla Ice Goes Amish 1 & 2. Good Morning America, Good Afternoon America, The Today Show and The Late Night Show. mentoring courses in Real Estate investments as well as upcoming live seminars around the US. His current TV show “The Vanilla Ice Project” on DIY won The Factual Award for the Best Home TV Show. last two years tour stops have included the USA, Canada, Great Britain, Ireland, Scotland, the Netherlands, Spain, Portugal, Russia, Egypt, Turkey, South Africa, Australia and other countries. 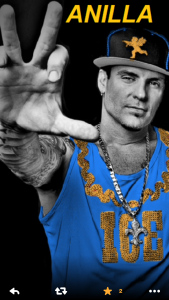 Vanilla Ice has appeared in commercials for Zumba with a launched remix of “Ice Ice Baby”, a Vanilla Ice lighting line for Capital Lighting, Castle Lite Beer in South Africa, Virgin Mobile in Australia, and internet ads for Hotels.com and Turbo Tax, and ads for the 7 Eleven – LA market, and Six Flags – Dallas market.